An ‘incredibly violent’ man who raided Goodwood House has been linked to a series of terrifying aggravated burglaries across the South East. 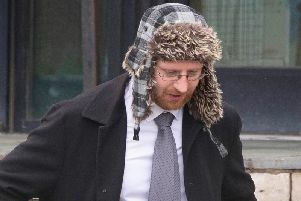 A lone burglar climbed through an upstairs window at the stately home in January 2016 before assaulting and tying up the then Lord and Lady March and stealing £700,000 worth of jewellery. Operation Prometheus. CCTV footage of the burglar getting ready to enter a house with a sawn-off-shotgun. Supplied by Surrey Police. Police now believe the thief is responsible for seven high-value burglaries in four counties, in which he entered homes armed with a sawn-off shotgun, threatening the occupants and binding them with cable ties. Detective Inspector Dee Fielding, from Surrey Police, said: “He is incredibly confident, he’s incredibly violent and we believe he has specialist skills, which is not usual for the burglars we investigate. She said the man was likely to be ex-military and could wait for up to a couple of weeks in the garden or nearby, watching the routine of a home for when a back door would be unlocked. Victims reported the masked man appeared to know the house layout and about safes or valuables in the home, such as irreplaceable family heirlooms and engagement rings. DI Fielding said the incidents had been traumatic for victims, who had been left in ‘absolute fear’ for their lives, and family members, including children, who were in the house at the time. Police have linked thefts across Kent, Surrey, Thames Valley and Sussex at intervals of four to six months from 2014 to 2017, typically to large, secluded properties that left little opportunites for witnesses. With little or no forensic detail, or other leads to work on, the four police forces are appealing for help from the public to track down the burglar. Sussex Police detective inspector Till Sanderson said: “We carried out an extensive investigation into the robbery at Goodwood House and exhausted all lines of enquiry. Should any further information come to light we shall not hesitate to pursue new leads. The man is described as white, around 6ft tall with a southern accent. If you know anyone who has a large amount of disposable cash, who disappears for periods of time, who has military skills and fits the description, contact police on 101 quoting Operation Prometheus.